We are very VERY excited to announce that Information Proficiency has been named a finalist in the 2018 Telstra Business Awards – WA Small & Succeeding category! “For 26 years, the Telstra Business Awards have been a hub for Australia’s remarkable small and medium-sized businesses to gather, explore their dreams, celebrate their achievements and to become ‘that’ business. These businesses have inspired us all with their resilience, courage, incredible commitment, and their ability to find new solutions and ways of working. Since 1992, the Awards have showcased some of Australia’s best business talent, with over 45,000 businesses nominated to date.” Andrew Penn, Chief Executive Officer, Telstra. “We understand that the growth of our company and our ability to deliver exceptional services relies on our ability to continually innovate and bring that innovation to our clients.” Ms Lisa Read White, Managing Director. We're proud of our team and the effort they put in every day regardless of the outcome. The winners will be announced in August so stay tuned. RSC were previously within MRWA, and existing records were hosted on MRWA's HPE RM solution. DTWD were to provision cloud infrastructure for RSC's HPE RM solution and manage the migration. RSC data needed to be identified and migrated out to their new infrastructure, with minimal disruption to MRWA, DTWD and RSC. RSC is required to comply with the RM regulations. Without a comprehensive, policy based solution like HPE RM, RSC would be non-compliant. HPE Records Manager provided a trusted a proven solution that met RSC's information governance requirements. HPE RM is well supported in WA and enables future imporvements like automation. The solution was deployed 100% in the cloud, no on premises infrastructure was used. The rollout was completed within a very aggressive timeframe. The configuration used for RSC was based on MRWA's HPE RM installation, with many changes to accommodate the smaller business. Over 100,00 records were migrated, including physical and electronic. RSC are now able to meet their governance and compliance requirements using a cloud based deployment of HPE RM. This solution further enables RSC to continue their good work to reduce road facilities in WA while managing costs down through automation, workflow and cloud infrastructure. The WAITTA INCITE Awards showcases ICT innovation and excellence across 10 awards - recognising individual achievement, product innovation and project excellence. The program provides opportunities to both the companies at the cutting edge of technology innovation as well as leading professionals across the industry to be recognised and celebrated. On Friday the 16th of June WAITTA Awards were announced. Information Proficiency made it through all the stages to become a finalist. 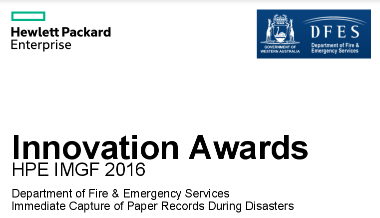 The submission for the award was under Most Impactful Social Benefit and for a project at DFES capturing content from the field during emergency incidents and feeding it live to Records Manager and the control room. This category had 5 finalists including us. Unfortunately we did not win the final award but we are proud to have made it to the finals. We would like to offer our congratulations to all winners, including Global Live who won this category. The Balconi Smart Torch was developed by Global Live, is a handheld two-way video conference system is primarily developed for remote telehealth care. The newly developed technology provides most remote and disadvantaged communities access to medical specialists globally, with connection over Satellite, 3G, 4G and Wi-Fi. How do we capture critical information as quickly as possible? The Proficiency Group has been named Kofax’s Asia Pacific Partner of the year at Transform 2014, Kofax's annual customer and partner conference, which drew a record 750 attendees from 32 countries. The Proficiency Group provide ICT Services within the fields of Business Process Management and Information Governance. Trading under the name Sigma Data Solutions the organisation provides solutions to improve business process efficiency, improved customer service, reduce processing costs and achieve regulatory compliance. The winners were chosen by an expert panel of judges comprised of Kofax executives and independent industry experts Sandy Kemsley of Kemsley Design, an independent analyst and application architect specializing in business process management and the social enterprise, and David Tyler, Editor of the UK's document and content management publication entitled Document Manager. "These winners truly embody the theme of Transform 2014," said Grant Johnson, Chief Marketing Officer at Kofax. "They‘ve taken Kofax products and solutions and deployed them in innovative ways to increase responsiveness to customers, provide a higher level of service, gain competitive advantage and better manage and grow their businesses. We applaud every winner for putting action behind their vision." This category is aimed at those RIM Professionals Australasia members who have achieved excellence in records and information management & contributed highly to the profession. This award can be self nominated or nominated by an independent person or group. Stephen has made a significant and unique contribution to the codification of best practice and in the innovation of new RIM standards that extends the boundaries of common practice at a global level. Stephen has contributed to many standards that provide the international environment for digital recordkeeping, e.g. as a member of the Experts’ Review Group for MoReq2 and by contributing to ADRI and CAARA publications. Stephen is the first RIM professional to have achieved the outstanding distinction of leading the development and publication of four ISO RIM standards in the same financial year (2010-11). The ISO process favours the development of standards where they are considered to contain work that is both relevant and useful to the international community and is most definitely a measure of competency and value. Stephen has been an active and enthusiastic champion of RIM and has taken a leadership role within the NZ RIM community by instituting initiatives such as the EDRMS Interest Group and serving as a representative on range of professional bodies such as the NZ National Digital Forum Board and Government Information Group. Named after J Eddis Linton, one of the founders of RIM Professionals Australasia, the J Eddis Linton Awards, celebrate his outstanding contribution to records management across three categories, individual group and student. This category is sponsored by Information Proficiency and is aimed at those RIM Professionals Australasia members who have achieved excellence in records and information management & contributed highly to the profession. This award can be self nominated or nominated by an independent person or group. Six nominations were received this year. Having considered all of the nominations the judging committee came to the decision that every one of the nominees have influenced their workplaces and demonstrated a strong, long term commitment to the records and information management industry and the association. All of the nominees scored equally in this area. It was not felt that any of the nominees had demonstrated an outstanding level of excellence in best practice or innovation (ie new thinking, inventiveness) and whilst they were all worthy of recognition for their ongoing commitment no one stood out against the others for their efforts. Therefore to be fair to all nominees the Individual category will not be awarded this year. Named after J Eddis Linton, one of the founders of the RMAA, the J Eddis Linton Awards, celebrate his outstanding contribution to records management across three categories, individual group and student. This category is sponsored by Information Proficiency and is aimed at those RMAA members who have achieved excellence in records and information management & contributed highly to the profession. This award can be self nominated or nominated by an independent person or group. Matt has over 20 years experience in information management. During this time Matt has made a considerable effort to share the knowledge and experience he has gained with colleagues. He has achieved this by presenting at numerous conferences (this includes presentations in New Zealand, Australia, the United Kingdom, the United States and Singapore) and talking to organisations about various information management endeavours. During Matt’s career he has worked in all aspects of information management. Roles have included project managing EDRMS implementations through to managing corporate wide strategic information management programmes and leading business transformation. Matt is also an adjunct faculty member at the Open Polytechnic of New Zealand for the information and library studies courses and has been a guest lecturer at Victoria University of Wellington on the Master of Library and Information Studies course. He has written a number of articles on information management, served on advisory bodies and has been approached by a number of organisations for his advice and guidance. Advisory groups have included representing local government on the Archives New Zealand Recordkeeping Metadata Standard Advisory Group and the user panel for the Model Requirements for the Management of Electronic Records (MoReq) International Specification. Matt has made a substantial contribution to progressing information management within not just Wellington City Council but also nationally in his work on the board of the Association of Local Government Information Management Inc (ALGIM). He has also for the last three years organised a local government records symposium to share knowledge and information – this was the first forum specifically for local government information management of its kind in New Zealand and has proved highly successful. Matt has led the development of a web-based expert system providing information and knowledge management tools and subject matter expertise on behalf of ALGIM. This will be made available to local government entities in New Zealand and overseas. Matt’s achievements in his current role at Wellington City Council have included substantially increasing staff engagement; pioneering the use of online learning to support the introduction of an EDRMS; transforming business processes through the innovative use of GIS; developing new services such as a training course run by our Corporate Library in online and database search strategies; being involved in running our leaders forum and improvements to the way they articulate their services to customers. Matt’s nomination demonstrated not only his passion for information management but his generosity in sharing knowledge. The Linton Awards Committee chose Matt’s nomination because of his ongoing work and influences in records and information management both locally and in an international context.